Since Monday the 15th of February prisoner Fabio Dusco began a hungerstrike against the special conditions of detention that have been imposed upon him by the police and the Ministry of Justice. Specifically, Fabio, who faces charges for the Conspiracy of Cells of Fire plan to escape from prison, was initially taken to Korydallos prison. In the early morning hours of the following day, riot police made a sudden intrusion into his cell and took him to the Attica Removal Centre. After the first day of the trial he was incarcerated at the Attica General Police Directorate. This demonstrates that special conditions of detention introduced with the emergence of Type C prisons not only have not been abolished, but still operate covertly. At the same time, the judicial dictators continue with their monologue, since, apart from Fabio, who is detained in isolation and has already begun a hunger strike, Athena Tsakalou and Evi Statiri cannot attend the trial as a consequence of the fascist restrictive conditions of their release which are still not lifted. Athena is exiled on Salamina island and Evi is not allowed to move further than a 1 km radius away from her residence. Tell us a little bit about what has happened concerning the academic leave of absence you have demanded within the new judicial framework after your hunger strike in November-December 2014. It goes like this: I completed 1/3 of the course as required by the new regulation and I made the request for educational leave. From that point on began the theater of the absurd. The prison board decided that the new regulation cannot be put into effect, it requires a joint ministerial decision and so it sent the request to the special appellate magistrate E. Nikopoulos, in line with the previous law. Nikopoulos issued a negative response because there is no ministerial decision and one cannot get into the merits of the application as the new judicial framework annuls and takes the place of the prior one. Based on the negative opinion of Nikopoulos, the Board rejected the leave request in its turn as the decision of the trial judge is binding. 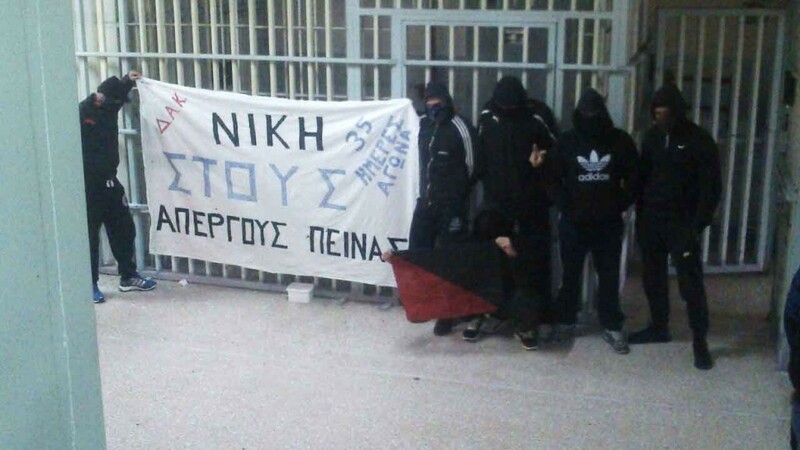 In the afternoon of April 1st 2015 anarchists of “Rouvikonas” collective “invaded” the grounds of the Greek parliament in the center of Athens to protest in solidarity to the mass hunger strike of 22 political prisoners in Greek prisons, most of them since March 2, and 8 prisoners from Turkey on solidarity hunger strike in turns since March 11.